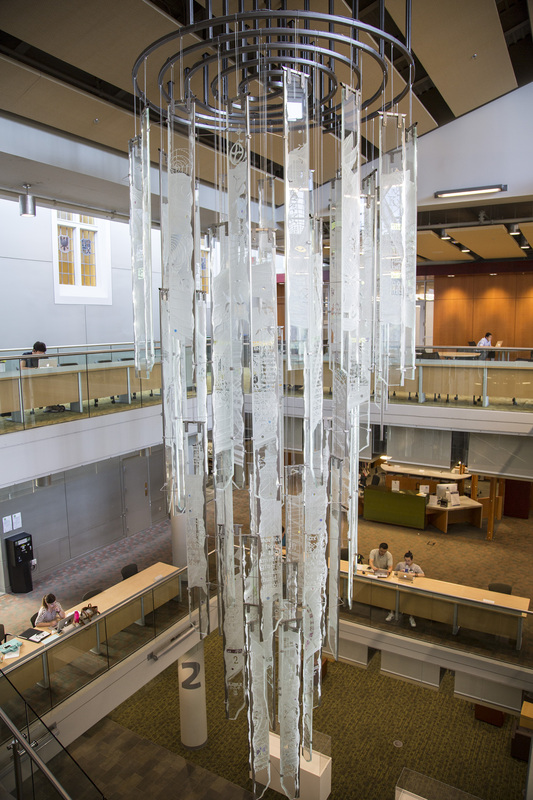 To inspire a sense of wonder and possibility in the minds of visitors to the Learning Centre, Dr. Irving K. Barber and his wife Jean asked Vancouver artists to create a series of dazzling glass installations. 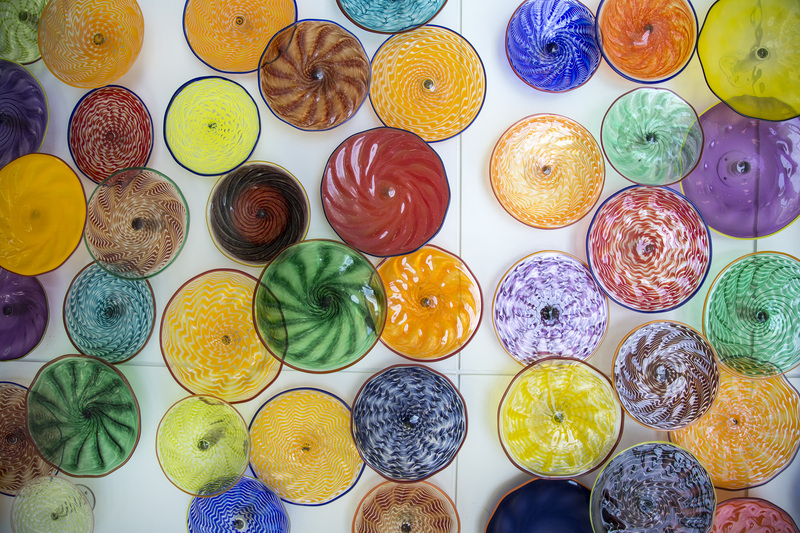 At your next visit, take a moment to marvel at the bright and changing colours of Jeff Burnette’s glass bowl installation at the Learning Centre’s southeast stairwell. 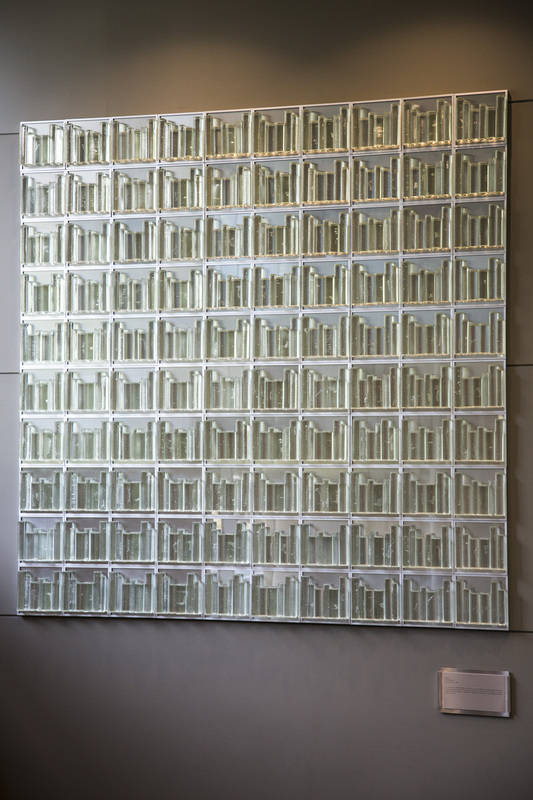 Belle Verre measures 60 feet from top to bottom and consists of two hundred blown glass plates. This exceptional installation took nearly four months to complete and three days to install. 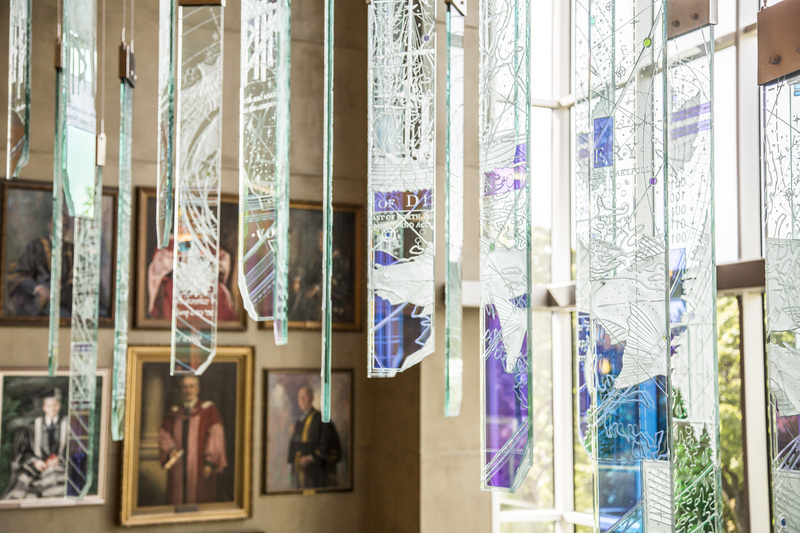 A series of 57 glass panels form Atrium, John Nutter’s public art contribution to the Learning Centre. His ambitious installation represents the evolution and discovery of knowledge. A close examination of his installation reveals text and runes from notable documents throughout history. Nutter used starfire glass — a lead-free, low-iron type of glass that lacks the green hue of ordinary glass — to achieve a delicate, translucent look. Special coating to each panel lends luminescence to his work and embedded LED lights add to the ambience. The installation’s lighting proved to be a challenge at first, as did making the installation earthquake-proof: Today, seismic clips hold the sculpture in place. The Magic of Discovery, another art piece by John Nutter, adorns the Learning Centre’s Ridington Room. The artist designed the 45-panel glass sculpture to “flow like the Northern Lights,” and centred the intricate glass etchings around a series of compasses. Nutter felt the Library, like a compass, should be used as a tool of discovery. Kevin Dubois’ installation Glass Bookcases consist of three pieces. One greets visitors inside the main entrance off of East Mall and another sits next to the Learning Centre’s south entrance. The Golden Jubilee Room houses the third bookcase. Dubois’ bookcases are crafted of red and cast glass to complement the Learning Centre’s “air of learning”.  We also have a featured section to Honour First Nations in the Building, which lists art and cultural objects by First Nations artists, sculptors and weavers.